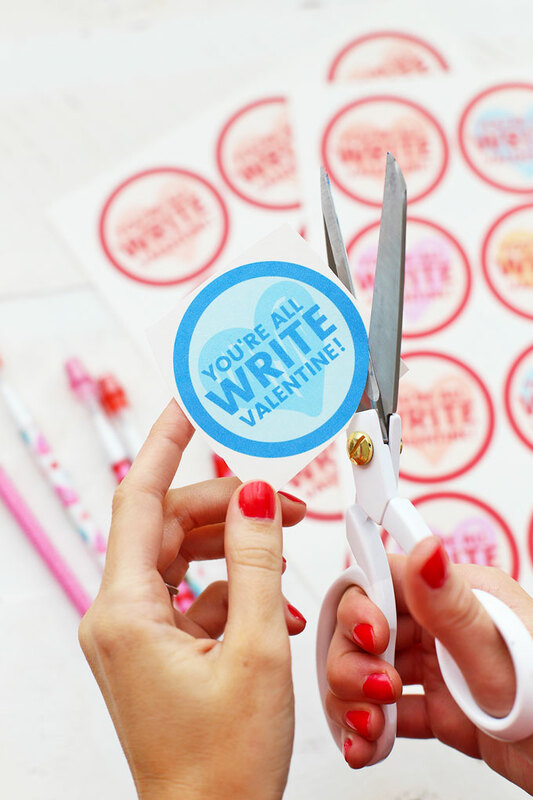 Printable Valentine: You’re All Write Valentine! – This free printable valentine comes in 3 different styles and works with pens, pencils, and crayons! It’s an awesome non-food valentine idea for school! Valentine’s Day is right around the corner, and I’m a mom who loves to keep things simple. We’ll do a fun breakfast (which will probably include a pink smoothie), dinner (probably one of these), and dessert (I’m looking at you, fondue! ), and bring homemade valentines to school to give to friends. Easy-peasy. Since they started school, Milo and Sophie have brought non-food valentines to their classmates. 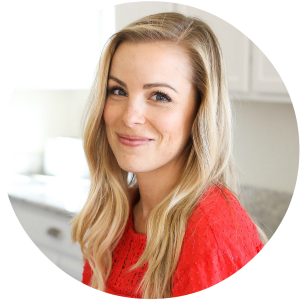 With so many food allergies and intolerances among kids these days, I love knowing that whatever we bring won’t cause any food allergy problems. As a mom of children with food intolerances and allergies myself, I know that it’s a bummer to sort out at least half the Valentine’s, Christmas, Halloween, Birthday party, and Easter candy kids come home with as something they can’t eat. My kids are *really* good sports about it most of the time, but even so, it’s always a thrill when someone brings something allergy friendly or non-food to give instead. 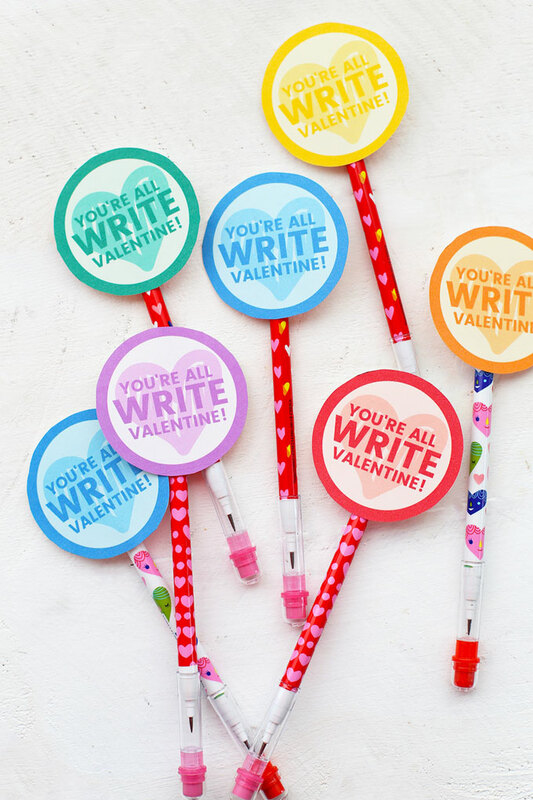 We’ve done these cute bubble valentines (which have been a big hit!) in years past, but this year, Sophie asked for something else to bring to class. Since all things crafty and creative are her love language, we worked on coming up with a printable valentine that gets kid creating. This “You’re All Write” valentine was just the ticket. It’s cute, it’s easy, it can be really inexpensive, and it comes with a FREE printable! Win! WHITE PAPER – (I suggest cardstock) for printing. 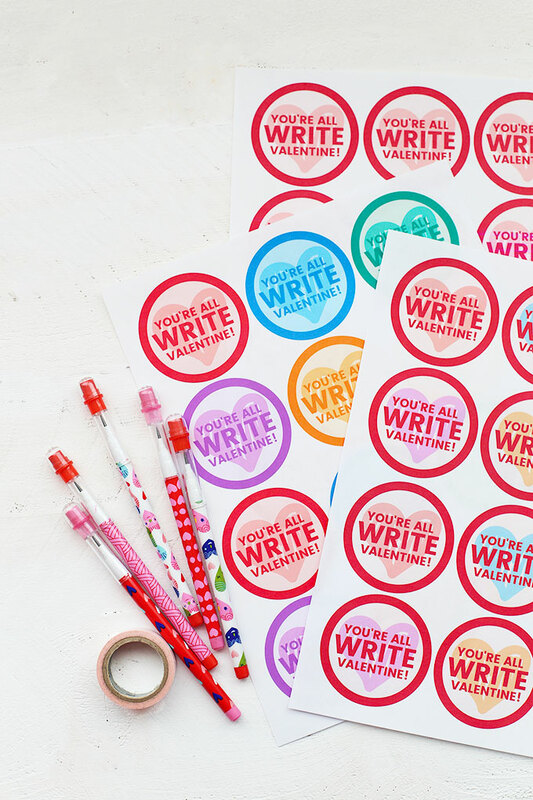 Cardstock is thick, stiff, heavy paper that will give you more stability and won’t get creased or bent easily, even in a box or bag stuffed with valentines. You can find small, inexpensive packs at Target, or order a bigger package from Amazon. PENS, PENCILS OR CRAYONS TO PACK WITH THEM – You can use any pens, pencils, or crayons you like for these. The Target dollar spot and Valentine’s Day sections usually have some inexpensive & festive choices that won’t break the bank. We picked up 2 (18-pack) bags of pencils for $3 each, but I also saw some $1 packages in the dollar spot. TAPE – This can be clear tape, or decorative washi tape. Whatever you want! Just something to attach the printable to the pencils, pens, or crayons. 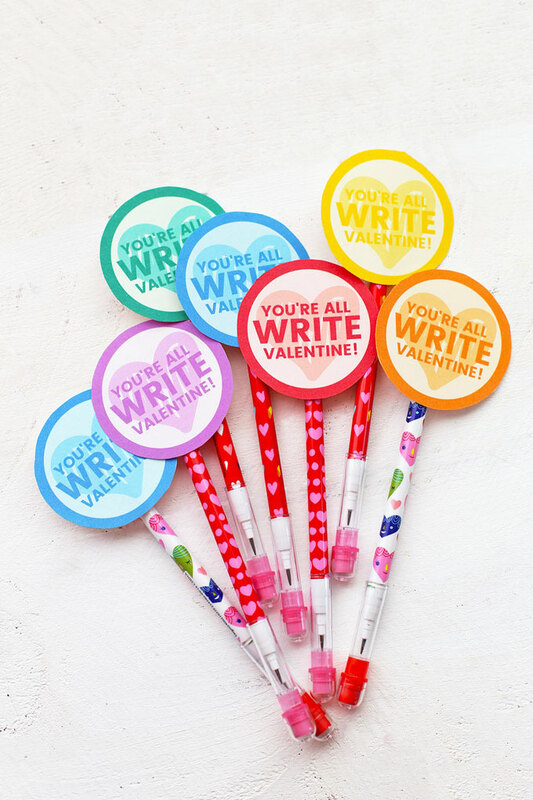 Valentine’s Pencils – These ones come with cute heart eraser tops! Rainbow Stackable Crayons – Sophie loves these! Lego Brick themed crayons – adorable with the multi-color printable! Gel pens – kids at our school LOVE gel pens. These are a great deal! Open the downloaded file and print the pages you’d like to use. I recommend using cardstock, if possible, for more stability. Page 1 is a red & pink version. Optional: Write your child’s name or any desired “to/from” label on the back. Attach to a pen, pencil, or box of crayons with clear or decorative washi tape. That’s it! Easy-peasy. And since one sheet prints 12 valentines, you’ll be done in no time! PS – Need More Valentine’s Ideas?